Good sport headphones have a lot of features. They need to be able to stay in your ears while you jump, run, or jog, resist a few aggressive meetings with the ground, offer remote control of your phone so you don’t have to pull it out of your strap or pocket, or better, allow you to leave it in your locker. These days, why even bother if they’re not wireless? And, oh yeah, it would be nice if music actually sounded great on them, too. Gogo-S is the totally wireless sport music player that hits all the right notes. It’s more than just a pair of tough-as nails wireless earbuds — and by wireless, we mean totally wireless, no wire connects one ear to the other — it’s a portable MP3 player and smart activity tracker with a heart rate detector and an interactive online training guide. The Gogo-S (or Gogos, for the purpose of this article) use “Duet Play Technology” to communicate with each other. This keeps your music in sync in both ears without going the route of other sport headphones that have a wire linking the two ears together. As independent ear buds, they come in different ergonomically designed sizes, Small, Medium, and Large to fit securely in your ear. The Gogos link to your phone or computer with Bluetooth. You can stream music when you’re bored with the 1000 or so tracks you can storee on them. Taps, swipes and presses on the all-in-one touch button on one or other earbud control not only the basics like track selection, volume, and on-off, but answer, end, or silence phone calls, and exercise-select as well. Yep, selecting exercises; Gogos work with the Go Sport app, which lets you select workout plans created by fitness experts and manage the data your Gogos collect. With an optical sensor and a 9-axis the Gogos discern movement from your heartbeat and tell you your dynamic heart rate. 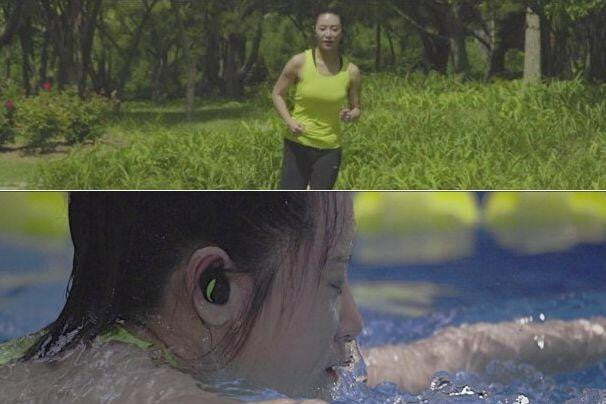 According to G-Wearables, the Beijing-based company that makes Gogos, these earbuds are more accurate at picking up your heart rate than the Apple Watch when you’re really pushing yourself. You can hear your speed, steps, and heart rate when the earbuds tell you about yourself, or view them on your iPhone or Android. The training guides can be relayed via audio, and your pace and heart rate adjust these real-time suggestions. Go Sport also lets you manage playlists of the songs stored on the earbuds. The best part: they’re waterproof to 1 meter — the mesh over the speakers are ip67 rated, and the PCB board is coated with Nano waterproofing, so you can use them in the pool and leave your phone far away from the moisture and hard tiles around the pool. They say over a million bucks in R&D went into these bad boys. They definitely fill a niche. The regular Gogo sports music player is already in presale set for a July 2015 release. It’s worth pointing out that without the cord connecting the two earbuds of the Gogo-S, you can’t take them out of your ears without putting them in a pocket or holding them in hand — you can’t drape them around your neck for a moment when you’re not using them. And since you can use them when swimming, they really need to fit securely, or float. At least they’re being touted as “drop proof,” so you don’t have to worry too much about them hitting the concrete or the hard gym floor. G-Wearables specifically recommends you take them out when boxing — they’re designed to avoid tumbles, not repeated beatings. They battery can last anywhere from three to five hours, but they come with a portable charging case that takes about 40 minutes to fully restore the charge, and will hold two charges worth of energy. For the weight-weenies out there, the Gogos weigh 11g for the pair. The going price for the Gogo-S Sport Music Player earbuds is $250, not cheap for a pair of wireless headphones, but not bad when you factor in the waterproofing, MP3 storage, call-answering, and the audible training and fitness tracking. The Go Sport app may have a separate fee structure; Digital Trends will update you when we know more. For now, you can grab a pair for $120 (taxes and shipping included to the US or China) on the Gogo-S Indiegogo page. G-Wearables plan is to ship to Early Birds by November, and the rest of the perks by December.